In this work, we present results on the formation of vertical molecule structures formed by two vertically aligned InAs quantum dots (QD) in which a deliberate control of energy emission is achieved. The emission energy of the first layer of QD forming the molecule can be tuned by the deposition of controlled amounts of InAs at a nanohole template formed by GaAs droplet epitaxy. The QD of the second layer are formed directly on top of the buried ones by a strain-driven process. In this way, either symmetric or asymmetric vertically coupled structures can be obtained. As a characteristic when using a droplet epitaxy patterning process, the density of quantum dot molecules finally obtained is low enough (2 × 108 cm−2) to permit their integration as active elements in advanced photonic devices where spectroscopic studies at the single nanostructure level are required. The simplest interacting quantum dot (QD) system is a QD molecule (QDM) composed of two closely spaced QD [1–3]]. QDM are receiving much attention both as playground for studying coupling and energy transfer processes between “artificial atoms” and as new systems, which substantially extend the range of possible applications of QD . In such systems, the coupling involves tunneling of electrons and holes between two adjacent dots separated by a thin intermediate barrier layer. In particular, it has been observed  that for a 4-nm-thick intermediate tunneling layer, the coupling strength is optimized for the spectroscopic observation of large electron anti-crossing energy splitting . It is, however, technologically challenging to obtain resonant quantum–mechanical coupling due to size, composition, and strain inhomogeneities inherent in self-assembled QD. In this sense, great efforts have been dedicated to the formation of vertical coupled QD by self-assembling processes . The most used fabrication process leading to vertically aligned QD is based on the formation of one layer of self-assembled QD, followed by a thin spacer layer. Then, upon further InAs deposition, a second layer of QD is formed, on top of the buried QD, by strain-driven processes. By this growth procedure, tuning of the emission energy of one of the QD at the same time that is maintained unaltered the emission properties of the other, although not impossible, is difficult to achieve due to the lack of control in size for self-assembled QD. The tuning effect of the emission energy of one of the QD forming the molecule respect to the other would permit to build symmetric vertical QDM, in which the energy emission of both QD forming the molecule matches, and asymmetric vertical QDM, in which the energy emission of one QD is blue-shifted or red-shifted respect to the other [5–7]. Apart from this lack of control in size of the QD forming the QDM by a self-assembling process, there is an intrinsic inter-dependent nature between the QD size and density that makes difficult the design of QD of a desired size and with a low enough density for its spectroscopic study at the single nanostructure level [8–10]. In this sense, here, we present a process that optimizes the growth of coupled structures in vertical arrangement by the use of a low-density nanoholes template fabricated by droplet epitaxy . In particular, after the deposition of the designed amount of InAs on the template that permits the formation of a first layer of size controlled nanostructures , a thin GaAs layer is grown to create a carrier tunneling barrier that separates a second layer of InAs nanostructures formed, via a strain-driven process, on top of the first ones. Thus, the growth procedure starts with the filling of previously formed nanoholes with InAs material. As detailed in , the nanoholes appear with a density of 2 × 108 cm−2, and they are 4.4 ± 0.8 nm in depth with a mean diameter of 43 ± 3 nm at their half maximum. On this pattern, three samples with different amount of InAs, 1.2, 1.4 and 1.5 monolayers (ML), have been grown at a substrate temperature of 500°C, growth rate rg (InAs) = 0.01 Ml/s, and As4 beam equivalent pressure BEPAs4 = 5–10−7 Torr. Once formed the first layer of QD (QD1 hereinafter), a GaAs intermediate barrier with a thickness of 4 nm is subsequently grown to guarantee a large tunneling effect . The growth of this layer is performed by atomic layer molecular beam epitaxy (ALMBE) growth technique  at a substrate temperature Ts = 450°C, growth rate rgGaAs = 0.5 ML/s, and beam equivalent pressure BEPAs4 = 2 × 10−6 Torr. At this moment, for completing the molecule structure, a second layer of QD (QD2 hereinafter), located above the QD1, is grown by the deposition of 0.9 ML of InAs at the same conditions used for the underlying nanostructures. With the aim of studying the optical emission of the resulting QD molecule structures, a 155-nm-thick GaAs layer is finally grown. A schematic diagram of these samples is shown in Fig. 1. Transmission electron microscopy images have been obtained to know the structural configuration of the resulting molecules. Figure 2a and 2b shows 002 dark field (cross-sections) transmission electron microscopy (TEM) images for the samples with 1.4 and 1.2 ML of InAs deposited into the nanoholes forming the QD1 layer. Contrast in this image is due to changes in composition, dark areas indicating the presence of In in In(Ga)As layers. 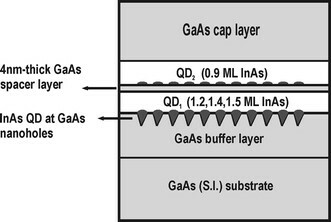 It can be observed the formation of the double structure that consists of two InAs QD separated by the 4-nm-thick GaAs barrier layer. Their respective wetting layers (WLs) are also clearly observed. It is noticeable that as a difference to the strain-driven formation of QD2, or in general, in a self-assembling process, QD1 forms at a lower level than the WL, clearly indicating a formation mechanism that involves preferential nucleation of InAs material into previously fabricated GaAs nanoholes by droplet epitaxy . In the case of depositing 1.4 ML of InAs (Fig. 2a), QD1 clearly presents a larger size than QD2 nucleated on top of it. On the other hand, when 1.2 ML of InAs are deposited (Fig. 2b), QD1 is more similar in size to QD2. According to these results, the aimed tuning effect on the size of QD1 by the use of nanoholes has been successfully obtained. On the other hand, despite this engineered change in size of QD1, the nucleation of QD2 takes place on top of the buried QD1 with same density of QD1 layer and similar dimensions in all cases. These results show that the size of the strain driven formed QD2 is controlled by the amount of InAs deposited. Moreover, the strain gradient at the surface is large enough to promote preferential nucleation of InAs just on top of the buried QD1, even for InAs deposited thickness of 0.9 ML, which is much lower than the critical thickness for QD formation in absence of local strain fields . Concerning the optical properties of these paired nanostructures, Fig. 3 shows the PL signal for the three different cases. 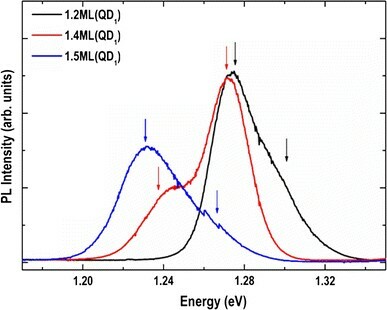 In particular, the black, red, and blue lines in the figure correspond to QD pair structures obtained by depositing 1.2, 1.4, and 1.5 ML of InAs for the formation of QD1 layer, respectively. The presence of two main peaks can be observed in all the cases. The evolution of these two PL peaks with increasing excitation power (not shown) reveals that they correspond to two different QD families, as they do not show any relative saturation effects corresponding to one QD family with ground and excited states. Combining these optical emission results with those obtained by TEM structural analysis, it can be established a direct correspondence of the different emission energies to the recombination of carriers at the upper and lower QD layers of the molecule structure. 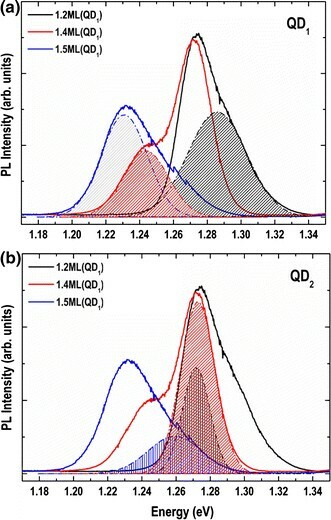 Figure 4a shows as filled areas the three different PL emissions that would correspond to the QD1 family for the three different QD paired structures. As expected from previous results , the effect of the different amount of InAs deposited in the first layer of nanostructures permits the emission energy of the QD1 to be tuned in a wide range. Table 1 lists the different values of the emission energies ascribed to QD1 and QD2 in the molecule structures. The arrow highlights the increase in PL emission peak energy of QD1 with InAs deposited. In a similar way, Fig. 4b shows the emission of the remaining three PL peaks that would correspond to the QD2 family in the QD paired structures. It can be observed that the emission energies are similar in all the cases showing that the size of the nanostructures formed in the QD2 layer remains almost invariable despite the different amount of InAs deposited underneath (see PL energy values in Table 1). More experimental work is needed to demonstrate if these paired QD structures show electronic coupling as corresponding to QD molecules. Altogether, these results show that by varying the amount of InAs material deposited at a nanoholes template formed by droplet epitaxy, the emission of a first layer of QD can be tuned to obtain either a symmetric or an asymmetric vertically coupled QDM. 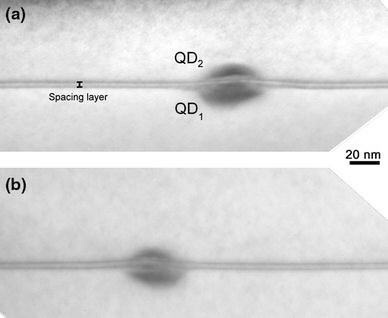 As a characteristic when using a droplet epitaxy patterning process, the density of QD molecules obtained is low enough (2 × 108 cm−2) to permit their integration as active elements in advanced photonic devices where spectroscopic studies at the single nanostructure level are mandatory. The authors wish to acknowledge to Spanish MICINN through projects Consolider-Ingenio 2010 QOIT (CSD2006-0019) and IMAGINE (CSD2009-00013), NANINPHO-QD (TEC2008-06756-C03-01/03 and 02), the Junta de Andalucía (PAI research group TEP-120 and project P08-TEP-03516) and CAM 2010 Q&CLight (S2009ESP-1503).